The Writers Alley: First chapter: Chop it or be Chopped! First chapter: Chop it or be Chopped! I am a Food Network junkie. And my favorite show? Chopped. Ooh, I love a good competition and quick results! The competitors get a basket of ingredients and must come up with a meal course in 30 minutes. 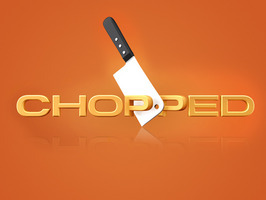 At the end of each round a competitor gets “chopped” if their dish is the most criticized. The competitors are usually full-time chefs. They are good enough to cook food to sell in their everyday lives. And they only get minutes to prove their ability to the judges. While I was reading some great advice from James Scott Bell in The Art of War for Writers, he reminded me that we as writers, are in our own episode of Chopped-- over and over and over again. At first, I resisted cutting my first chapter...I loved my first chapter! It was the first breath of life into the character in my head. But once I sat down and tried to start from chapter 2 (more action and dialogue), I realized that most of my chapter 1 could be summed up in a few sentences, and shown through out the rest of the first few chapters. If you watch Chopped, you'll see that the chefs might find their original plan must be changed to keep up with the clock and create a tasty and impressive dish...it's tough for them to do since they're racing against the clock, and for us, it's tough to cut those words that flowed from fresh inspiration. But try it...you might find they were the ground work for a winning dish! Come up with that winning appetizer to intrigue those agents and editors to move on to your main course. Don't get chopped after those first chapters! What techniques have you used to tighten up your first chapters for submissions to agents or contests? I'm a big time first chapter chopper. It hurts, but the results are the best. Since I've had to chop so many chapters, when I started my WIP I found that I finally was able to start in just the right place FINALLY! But this is book number 5, so it's taken some learning. My first book hasn't been touched for years. My second book had the first 4 chapters chopped off. My third book had the first 3 chapters chopped off. Now, on book 5, I think I've started it in the right spot too. Great post, Angie. I chopped my first chapter, but kept a couple of important story elements when I re-wrote chapter one. Who knows, I may end up chopping chapter one again. For this month, I'm working on getting my story on paper. It's not pretty, but it's exciting to see all the elements of the story being transported from my mind and heart to the page. I KNOW I'm going to need to work on hooks and good opening lines for my scenes. That will come after I get the story into written words. I'm going to be referring back to this post. Thanks, Angie! Great advice, Angie, cleverly delivered. I have a couple of stories tucked in the remote realms of my computer's hard drive with first chapters I'd need to nix if they were to stand any chance of catching a publishing pro's attention. They're yawners. Pepper-That's great that you started at the right place in your wip! I HATE chopping words...so it would be nice to nix this technique! Actually I have the first page written of an idea I have played with in my head, and it's starting in a high stakes moment...wish I'd finish up my wip so I can get started on that one! Jeanne- It's awesome that you have gotten your story out this month! To see it evolve and grow into a complete story is so rewarding! Keli- Isn't it funny how we can write and think it's brilliant, then go back months later and realize it is not so? I think it's necessary though, to write "yawners" because in that process we develop characters, story lines, back story, and it catapults us into momentum for the rest of the story. I've never considered cutting my first chapter before. Thanks for giving me something to think about! Rebecca- I have heard it said several times in the past...and have resisted! But it does work in certain instances. Casey- It amazes me how much I can cut each time I go back to my writing. Glad you were able to fall in love with your opening!